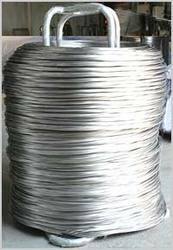 We hold expertise in manufacturing, supplying and exporting excellent range of Pure Zinc Wire in the industry. These zinc wires that we are offering have excellent electrical conductivity made from top grade zinc materials. Our zinc wires are very reliable and long lasting which offer easy applications. These zinc wires are strong, have excellent tensile strength and wear resistance. Our zinc wires are highly demanded in different industries such as automotive, electronics, fabrication and many other industries. We "Synco Industries Limited", are one of the most reputed and acclaimed firms, engaged in manufacturing, supplying and exporting wide range of shot blasting machines, pollution control systems, metal spray guns, flame spray gun, ventilation systems, paint spray machines & various other industrial equipment. Please click here to view our range of products and services. We are an ISO 9001:2008 certified Company. Since 1982 when we were established, our company is successfully meeting the abrasive blasting & peening requirements of the clients. Having mastered the science and art of abrasive blasting and peening, we are offering premium quality range of equipments that are used for various surface cleaning / preparation purposes. Our skilled and efficient staffs, these professionals are aware of the trends prevailing in the market and make sure that the clients are served accordingly. We train our team on regular basis so that they can carry their tasks in an efficient manner. Our professionals are highly experienced and ensure that the tasks given to them are completed in timely manner. No. 16- A- 3, Heavy Industrial Area.